You’re about to hear a lot from the Democratic National Convention about the Master of the World the rest of us call President Barack Obama. Since the Charlotte convention will place national security at the fore of Obama’s reelection hopes, Democrats will show voters Obama The World Leader, Obama The War-Ender, and above all, Obama The Osama Killer. And all of this will risk Obama missing the greatest opportunity of all: declaring an end to the United States’ 11 years of fear and bloody, expensive global counterterrorist war. Democrats, for the first time in decades, have an advantage with voters on national security. A June Fox News poll found Obama had a 13-point advantage on counterterrorism; and an August Reuters poll gave him a nine-point advantage on national security and foreign policy in general. And media reports about their imminent Charlotte confab indicate they’ll seek to maximize that newfound advantage. Bryan Bender of the Boston Globe reported Monday that the convention will emphasize how Obama (mostly) ended the Iraq war and is drawing down in Afghanistan; how he’s working with other countries on issues like preventing a nuclear Iran rather than in spite of them; and, especially, how he ordered the Navy SEAL raid that killed Osama bin Laden. More subtly — but unmistakably — they’ll likely say that GOP nominee Mitt Romney is a geopolitical lightweight and a reckless warmonger. But like the dog who finally catches the car, it’s unclear if Democrats actually know what to do with their new national security bona fides. Because the portrait likely to be displayed in Charlotte leaves out most of what Obama’s foreign policy really is, at least on counterterrorism: a continuation of the policies of George W. Bush’s second term, when Bush sanded down his harder edges. (More about that in a second.) And, unless Obama really plans something dramatic and unexpected for his Thursday renomination speech, he’ll miss a huge opportunity to say that the U.S.’ painful and single-minded focus on counterterrorism can finally come to a safe, responsible end. That opportunity comes as an inadvertent gift from Obama’s political opposition. There was something missing from last week’s Republican convention in Tampa: the paranoid, wasteful, divisive and effective politics of the 9/11 Era. You didn’t hear a repeat of Sarah Palin’s accusation that Obama is “worried that someone won’t read [al-Qaida] their rights,” as she did four years ago. Nor did you get a remix of Zell Miller’s (in)famous 2004 assertion that “today’s Democratic leaders see America as an occupier, not a liberator.” Since Romney thinks he can defeat Obama on a message of economic recovery, his convention relegated national security to the margins. Romney’s own nomination speech tucked a short segment on global affairs toward the end. He did not discuss 9/11, nor the Afghanistan war — as the Obama campaign didn’t hesitate to remind reporters in blast e-mail after blast e-mail. It was a striking break from the previous two GOP conventions and presidential elections. George W. Bush accepted renomination in 2004 by arguing that his Democratic opponent, Sen. John Kerry, was too weak and indecisive to defend the U.S. from another 9/11. McCain ran four years later by similarly arguing Obama was too weak and naive to protect America. It was a remarkably effective political message, marginalizing antiwar voices in the Democratic Party or convincing Dems to sound like Republicans. Yet Romney’s 2012 version veered so sharply from that template that he earned a rebuke from the incredulous Republican pundit Bill Kristol. A couple hundred drone strikes and a raid on a certain Pakistani compound probably make that message a nonstarter. But it remains to be seen how Obama capitalize on Romney’s elision of national security. One option, the one that looks like it’ll be on display in Charlotte, is to show that Obama can successfully handle the challenges of a dangerous world; and to argue that Romney can’t. Obama isn’t Bush. His approach to counterterrorism is more like a stiletto than Bush’s sledgehammer. That contrast comes through when examining Obama’s first term and Bush’s first term. But when you look at Obama’s first term and Bush’s second term, the distinctions become blurrier. 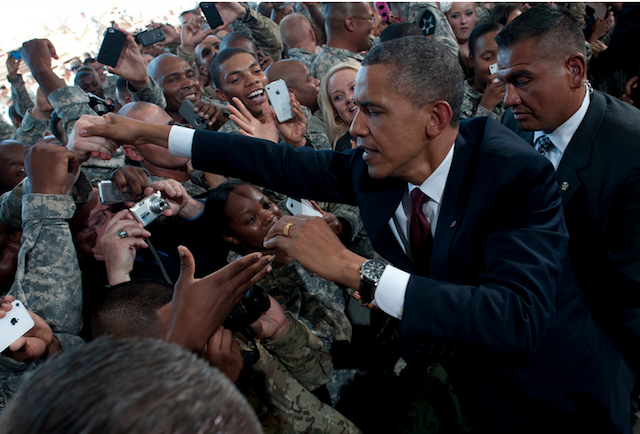 Obama tripled troop levels in Afghanistan, expanding Bush’s build-up there. Obama waged an aggressive drone war in Pakistan – one that began to take shape in Bush’s final year in office – and then expanded the shadow wars to Yemen, Somalia and East Africa. And of course, Obama kept Bush’s Defense Secretary and his top general. The day after Romney’s speech, Obama told soldiers at Ft. Bliss that his administration has “taken out more top al-Qaida terrorists than at any time since 9/11.” He has stopped fighting to close the Guantanamo Bay detention facility after bipartisan congressional opposition doomed one of his 2008 campaign pledges, and even found novel places to hold terrorism detainees. As the GOP convention ended, the Justice Department quietly announced it would not indict anyone for torturing detainees in CIA custody. Perhaps some of the Republicans’ silence on national security is an implicit recognition that Obama has carried out their foreign policy better than they did. But Obama has been less successful in articulating an end to the 9/11 Era Bush began, and it’s a major disconnect at the heart of his national security record. On the one hand, the Obama team contends, credibly, that al-Qaida is practically a spent force as the result of drone attacks and commando raids stretching from the Horn of Africa to the Pakistani tribal areas. But on the other, it argues that those attacks have to continue indefinitely. Senior Obama counterterrorism professionals concede they actually haven’t figured out how they’d even know if the terrorist movement is actually beaten. 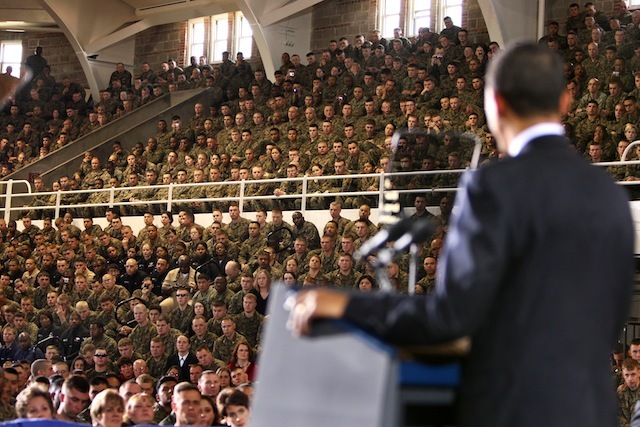 Obama can truthfully tell voters that he got U.S. troops out of Iraq — although maybe he should credit Bush with acquiescing to the Iraqis’ demand for that in 2008 — and will end direct U.S. combat in Afghanistan by 2014. But he can’t truthfully tell Americans that their unhappy experiment as a global counterterrorist force is finished as long as Predators loiter over Mirin Shah. Similarly, Obama has said absolutely nothing for four years about rolling back expansive surveillance programs — whether by the National Security Agency or the FBI — that arose after 9/11. While that surveillance state was supposed to be a temporary response to an emergency, dismantling it remains a marginal political position, since politicians don’t want to be smeared as terrorist fellow-travelers. It’s gotten to the point where maintaining the wartime government apparatus — sometimes by design, sometimes by inertia — isn’t even a partisan issue. GOP Senator Rand Paul, a Tea Party favorite, has become one of the Senate’s leading voices for civil liberties, and for it has been demagogued by the Democratic Senate leader. A majority of Americans want to end the Afghanistan war, yet relatively few Washington politicians heed them. (No wonder Obama will emphasize the end of his surge in Charlotte, rather than the surge itself.) If Obama wanted to change the politics of national security, the GOP convention has provided only his latest opportunity to do so. Instead, there’s a tempting alternative: calling Romney weak on national security. In the spring, Obama cut an advertisement highlighting a 2007 interview in which Romney said it wasn’t worth “moving heaven and earth” to find bin Laden — omitting Romney’s subsequent clarification that “of course” the U.S. ought to kill al-Qaida’s leader. The Democrats may not get that explicit in Charlotte. But key surrogates like Massachusetts Governor Deval Patrick argued on the convention’s eve that “bringing Osama bin Laden to justice” was among the major contrasts Obama ought to draw between himself and Romney. Kerry, the 2004 nominee who was attacked as weak on security, plans to give a major speech arguing, “You can’t be strong at home if you are not strong in the world.” Message: Romney is a wuss. In fairness, any president who avenged 9/11 would be guilty of political malpractice if he didn’t remind voters he had Osama bin Laden killed. But it’s a question of what Obama says about the significance of that death. It could be the way to credibly say that al-Qaida’s days are numbered, and that the U.S. is only a few drone strikes away from its long-awaited victory in the war on terrorism. But if all Obama does is to include the bin Laden raid in a laundry list of national-security achievements, the best he can do is argue that he can be trusted to keep waging a global war that no one actually talks about successfully ending. To do so requires taking a risky political choice. As Rand Paul learned when he argued that it’s time to let the Patriot Act expire, politicians who argue that the terrorist emergency is a waning threat are constantly at risk of being slimed. Yet unless political leaders finally make that choice, they’ll find their broader geopolitical ambitions constrained. Obama talks a lot about “pivoting” to a focus on core U.S. commercial interests in Asia, yet his real foreign policy is found in the climbing tally of drone strikes worldwide. If Obama wants to change that — and the GOP gave him the chance to — the place to start is Charlotte.